We have a contract with the Legal Aid Agency to provide legally aided mediation. If you wish to be assessed for Legal Aid Funding, you will need to provide evidence about your household income received the month prior to your individual meeting date. This assessment is completed at your meeting by the Mediator. If this information is not provided, the assessment cannot take place and our private fees will be charged at the rates set-out below. If you are not eligible for Legal Aid but the other party is; the first joint mediation session for you both is free. All fees are inclusive of 20% VAT. A £20 booking fee will be taken when you book a MIAM appointment against non-attendance or late cancellation (less than 48 hours). If you decide to continue with mediation or to take the form for Court, the remaining balance of the fee will be payable. If you decide not to continue with the mediation process following your MIAM, you will be refunded the booking fee. The £20 booking fee can be waived if you provide your evidence of income, proving eligibility for Legal Aid, prior to your MIAM and then all other meetings will be free. 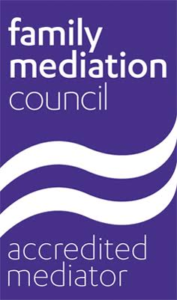 The mediation session fee will be taken prior to booking your joint meeting. This is held against non-attendance or late cancellation (less than 48 hours) which will be charged at £40. Every referral received will have the option to Fast Track the process. If you would like us to contact the other party straight away, the case management fee of £70 can be paid straight away and a letter will be sent prior to your MIAM. If, during your MIAM, you are assessed for Legal Aid and you qualify; we will refund all fees. A current letter (dated within the last six months) advising you of your entitlement to this benefit or an amendment to the amount (your appointment card will not be enough).